This Old Relic Has Been Sold. Presented is an ebony frame, ivory arc, antique sextant made by the well known British maker Spencer, Browning & Rust. of London, who was in business until 1840.The instrument is in very good condition having all its hardware and missing only the small ivory plate on the back which was for notations, and the small ivory pencil that was housed in the cross member of the frame. The ivory of the name plate and the numeric scale of the arc have darkened over time with a light brown hue. There is a number, painted in white ink on the back of the frame, i.e. 89.00.1803. This is the mark of a museum and signifies when it was acquired or deacessed. It adds appreciably to its value. The instrument was recently polished and lacquered to put it in elegant condition. The arc measures from - 5 to plus 105 degrees. The ivory plate on a cross bar between the two limbs is engraved "Spencer Browning & Rust. London". Additionally, in the center of the ivory degree's scale between 50 and 55 degrees is inscribed in script "SBR" identifying the ivory was engraved by Spencer, Browning & Rust, of London. The label on the right inside cover is from the well known instrument seller, C.R. Sherman of New Bedford, MA. It is in excellent original condition. Sherman worked for John Kehew, 1849-59 in New Bedford, MA; and succeeded him in 1865, which means this instrument had considerable use before it was serviced or resold by Sherman. SBR was in business in London from 1784 to 1840, specializing in instruments for navigational use. It's business continued under the name of Spencer, Browning & Co. which ceased business in 1870. Spencer Browning & Rust had an early dividing machine and inscribed arcs for others. NOTE: The white number in the picture of the back of the sextant above is from a museum and is an accession number from when they acquired it. Or a deaccession number from when they sold it. This beautifully made instrument has a ribbed brass index arm and measures 12 inches long on the index arm. The horizon mirror is on an adjustable turntable and can be rotated by an arbor. Note the thumb screw, ivory vernier scale, reading from right to left from 0 to 20 arc minutes, a peep sight , and a single set of sun shades which help date the instrument. There is no provision for a handle on this sextant which marks it as a transitional piece between an octant and a sextant. Some time after 1780, the addition of a tangent screw, as fitted to this instrument, allowed for fine adjustment and represents one of the two major changes in the basic operation of the octants and sextants for the next 150 years! The second was the fitting of telescopes which is lacking here. This sextant was not fitted with a handle which indicates it is one of the earliest of that type made by Spencer Browning & Rust. THE CASE: The Mahogany "Keystone" case is in good condition and has been refinished. It has a hole in the bottom from the sextant's center leg, and has a replaced corner on the top right. There are cracks on the bottom and some warping. There is a lock recess, but no lock and no key. A label from C. R. Sherman on the inside is in excellent condition. INSTRUMENT CONDITION: The sextant has been recently polished and lacquered which makes it suitable as a gift. The mirrors are in much better condition than might be expected though they do show some age. The horizon mirror has a grey area in the upper right corner. The ivory is has taken on an unusual brown color, but the engraving is distinct. Missing is a small ivory plate on the back, and a lead pencil cap. The index arm clamp is complete. The shade glasses are complete and in good working order. The ebony frame shows as near new. The instrument has its original machinery, with a two hole peep sight Everything is original and in good working order. This is a highly desirable and worthwhile example from one of the best known English instrument makers. Width of frame at arc 9 1/2"
This is a special relic and a great find for that important person who will appreciate the finest. OUR QUALIFICATIONS: We are one of the few company's still selling navigation instruments that know anything about them. For purposes of judging whether Joel's opinion counts, he was the editor of the chapter on sextants of the 1977 Edition of "Bowditch", The American Practical Navigator, NAVPUB 9; a member of the U.S. Naval Academy Navigation Symposium, 1975 -1978; the author of a book on marine sextants, Cornell Maritime Press,1975, and the founding president of Nautech Maritime Corporation which partnered with Tamaya of Japan in the introduction of the MS 733 Spica, the MS 833, Jupiter, MS 933 Venus sextants and the famous NC-2 navigation computer, in the U.S. market. Joel is a retired Master Upon Oceans, and held a U.S. Navy "D" Qualification as a Senior Skipper - Oceans. For six years he was a Varsity Offshore Sailing Team Coach at the U.S. Naval Academy. 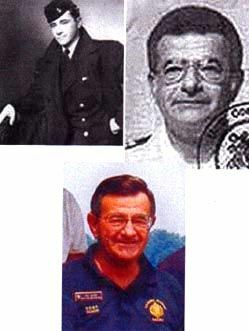 Some of his present and past memberships include: Naval Academy Alumni Association, Associate Life Member; Association of Naval Aviation, Life Member; Silver Wings, The Tailhook Association, Naval Academy Sailing Squadron, McCampbell's Aces Squadron, Founder & former CO; Naval Historical Foundation, and the Naval Order of the United States. This special article of maritime history is a perfect gift for someone who can appreciate the finest and rarest collectible. Copyright 2016 - 2014 by Land And Sea Collection. All Rights Reserved!